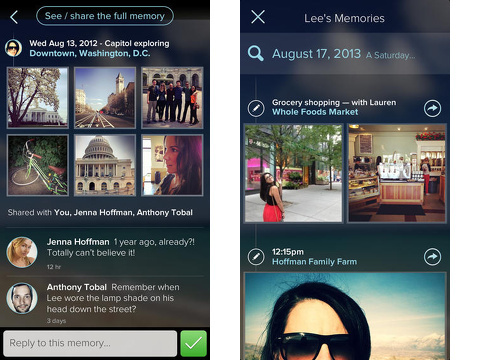 The Memoir iPhone, iPod Touch, and iPad app creates a digital journal of your social networking activity and photos. You sync Facebook, Instagram, Foursquare, authorize iPhone photo library, and photos saved on your computer to create a lovely, sophisticated feed. Your feed is automatically private, but you can select when, where, and if you want to share. An interactive tutorial where you authorize permissions introduces you to features and intents. You allow permission to access photos and location. The Facebook authorization requires basic profile info, friend list, status updates, check-ins, photos, and friends’ photos. You are assured that Memoir will never automatically post to Facebook. For Instagram, you must permit access to photos, friend list, and profile info. You are warned that it may take a “few days” to get your memoir. I opted out of receiving any push notifications, and I didn’t go back to the Memoir iPhone app to monitor progress. I did receive an email about 24 hours later to let me know my memoir had been created. In that 24 hour period, I did not notice diminished battery life. That is not necessarily always the case with iPhone apps that require a long crunch time to synthesize data from multiple sources. You move to a new screen to view a day’s history where you can view, edit, and enhance your memories. Each day is set up as a timeline. Your most recent activity is at the top of the feed, and you can check out your social shares and photos. There is a small pencil icon at the top of each shared item. When you touch this icon, you move to a new screen to add location and thoughts. The opportunity to add other details is a thoughtful touch. You can share with friends on Memoir, Facebook, Twitter, and Instagram. You can also delete from the Memoir iPhone app. Since the default setting in Memoir is private, you have freedom to decide on a case-by-case basis what you may want to share. This private setting also transforms your memoir into a journal for your eyes only. 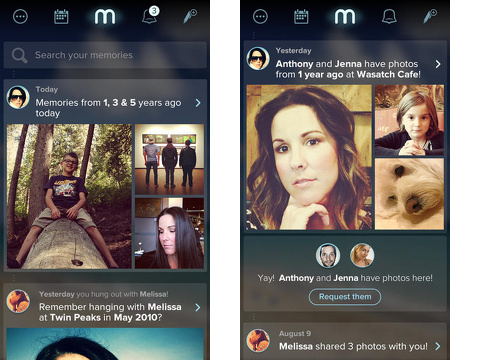 The Memoir iPhone app does have capabilities to cultivate a Memoir social network. You use the top menu bar from your Memoir iPhone app home screen to access these functionalities. The icon with three dots opens a sliding left menu to invite friends and check out Memoir friends’ activity. You can also touch the pen icon to create a Memoir iPhone app status update, share a location, and take a photo. But, if you are looking for another social networking iPhone app, I still prefer Path. The strength of the Memoir iPhone app is providing a cohesive history of your social experience – not adding another one. The Memoir iPhone, iPod Touch, and iPad app is a pleasant surprise, as the interface, navigation, and visual presence are attractive, functional, and highly useful. AppSafari review of Memoir was written by Jenni Ward on October 16th, 2013 and categorized under App Store, Free, Fun, Notes, Photos, Social, Video. Page viewed 4294 times, 1 so far today. Need help on using these apps? Please read the Help Page.